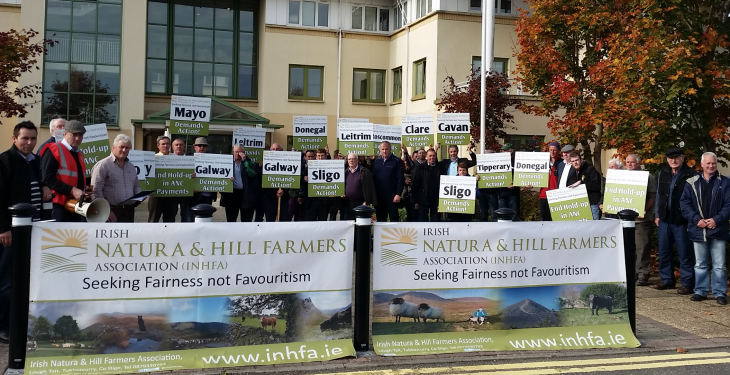 The Irish Natura & Hill Farmers Association is holding a picket at the Department of Agriculture offices in Portlaoise today (Wednesday) to highlight delays in payments under the Areas Of Natural Constraint Scheme. It says that while the issuing of payments for this scheme has always being slow it has being particularly acute this year especially for hill and commonage farmers. INHFA National Chair Mr Brendan O’Malley stated that “the hold up in these payments has affected the farmers most reliant on the scheme and its time these farmers were treated with respect”. The INHFA has being told that payments can’t be made if there is a mapping (reference area) or stocking rate issue with any farmer’s application. O’Malley outlined how these problems can be addressed presently and in future by paying out in full all payments when they fall due with minor over claims being clawed back from later payments. “On the issue of stocking rates many farmers have being forced to carry less stock than the minimum for environmental reasons. This results in these farmers requiring derogation each year which delays their payments. “A practical solution to this would see these farmers tick a box on their application stating they need a derogation and supplying the GLAS or AEOS reference number. By carrying out these two actions O’Malley added “we would give farmers a level of certainty on their cash-flow while easing pressure on Department staff by giving them a longer time to process clarifications”.